As defined by the National Slate Association, a turret is “a small, round or polygonal tower in plan, often with a conical or hipped roof”. Also known as a conical or radius roof it helps to know your geometry! 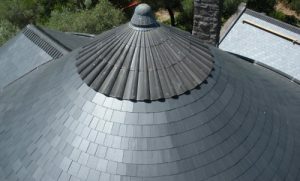 The following are a couple of things to keep in mind when it comes to a natural turret slate roof. 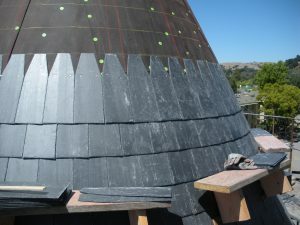 Every piece of slate on a turret roof is trimmed one at time. This can be done in the shop, on the ground or on the roof. Typically the slate roof tools are a guillotine trimmer or a John Stortz & Son Power Slate Cutter. The North Country Unfading Black roof slates have been popular with slaters as they are easy to trim with virtually zero breakage. The nail holes are punched before the slate is trimmed. On the top course, the nails are punched on top of each other and away from the sides of the slate. 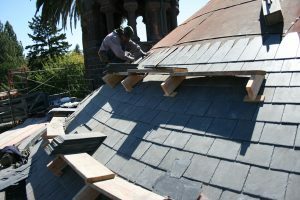 In order for the slates to lay flat on the curve of a turret, the upper corners of the slate are clipped. Some call this “rounding the shoulders” or “dog earing”. When it comes to installing the underlayment, care must be taken to ensure wrinkles don’t interfere with the layout chalk lines. The underlayment also protects the roof from wind-driven rain. The first course of the slate will use the widest sizes. As the circumference becomes smaller, the widths naturally will become smaller. It’s important that the proper headlap is maintained. Most turrets have a metal finial or a cap at the top. Aesthetically this enhances the appearance of the turret roof. 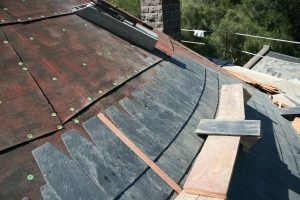 Functionally, this provides a watertight installation as it’s not possible to install slates at the very top. 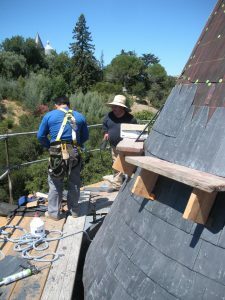 Slaters use brains (geometry), skill and talent when it comes to installing a natural slate turret roof. 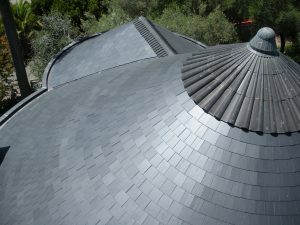 A natural slate roof truly is a unique piece of art as opposed to an engineered rubber “fake” slate that comes in a “turret package” box packaged in labeled bundles. When comparing natural slate vs composite rubber slate, think of your roof’s life expectancy. A good quality North American produced ASTM S-1 rated roofing slate will last 75 plus years. 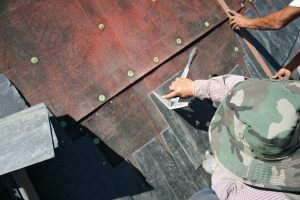 If you are considering a rubber slate roof find out how long the company has been in business and ask for some project references. 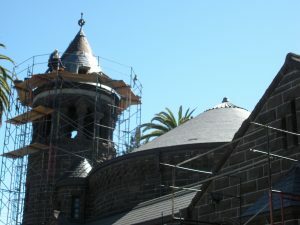 It’s hard to compete against a natural slate roof’s proven track record on 100 year old churches, universities or homes. A reputable slate supplier will have annual ASTM tests performed to ensure they meet the strict requirements of an ASTM S-1 slate. 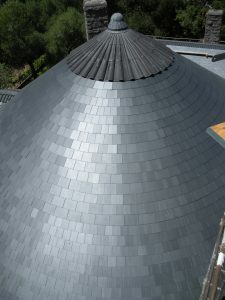 A natural slate roof is also fireproof and non-combustible.